A post inspired by Asterix, Pushkin and New York’s Latino community on why bilinguals are the real innovators when it comes to language change. As anyone who has read David Bellos’ ‘Is That a Fish In your Ear?’ will know, translation is a wonderful thing. First of all, the act of translation necessarily puts every aspect of language – from phonology, to grammar, to its relationship to social and cultural context – into sharp focus. What’s more, how else but through translation would us mortals – speaking only a handful of languages if we’re lucky – have insight into the many cultures of the world? But, to me as a linguist, translation is also interesting because it can explain much about how the languages we speak are constantly evolving. Some language change, as it is known, can be explained by what are known as internal changes: acts of creativity and simplification by particular innovators, which then spread across the rest of the language community. The internet driven phenomenon of 2013, the ‘because + NOUN’ construction in English, is an obvious example. But sociolinguists now know that much language change can only be explained by external factors – that is, as a result of language contact with other languages and dialects. Implicit in this sort of change is the creative use of linguistic features from one language – words, phrases, and even grammatical forms – in another. Implicitly, the innovators here are speakers from a particular community who are, to some degree at least, bilingual; the creative act is essentially an act of translation. Just after Christmas, I settled down to watch the latest film adaptation of Goscinny and Uderzo’s Asterix and Obelix comic books: ‘Astérix et Obélix: Au Service De Sa Majesté’. I was excited – not least because I’m a life-long fan of the comics and a closet Francophile – but because it’s an adaptation of my favourite of the series: ‘Asterix in Britain’. I wasn’t disappointed. As with the original, there’s plenty of parodying of English culture, not least the food (boiled boar with mint sauce, for example, is a particular British ‘specialité’). Other features of English are exploited too. All the British characters speak French with an English accent; as well as using English phonology, they speak sentences using stress timing, rather than syllable timing. And English idioms, which don’t exist in French, are directly calqued. As in the comic, Jolitorax says things like ‘je dis!’ (‘I say!’), ‘secouons-nous les mains’ (‘let’s shake hands’), and ‘et toute cette sorte de choses’ (‘and all that sort of thing’), which don’t exist in French. Such language play is not only a feature of Asterix and Obelix. I remember watching a cartoon as a kid, in English but set in France, where characters would say things like ‘what is it that it is?’ – an obviously French-sounding calque of ‘qu’est-ce que c’est?’. In literary translation too, there are plenty of examples of where linguistic features from the source language are borrowed into another. Usually, the aim is to give the reader a sense of what David Bellos calls ’foreign-soundingness’: think of a decorative ‘tête-à-tête!’, ‘château’, ‘Présidente’ or plain ‘Madame’ in an English translation of ‘Les Liaisons Dangereuses’. It may be hypothetical, but there’s direct relevance to real-life language change. Recently, researchers have discovered that the Spanish speaking community of New York City tend to use these optional pronouns much more frequently that other Spanish speakers. Authors of the study believe that this is a result of contact between the Latino community and the majority language of the Big Apple, which isn’t so laissez-faire with its pronouns. In some sense, you could say that bilingual Spanish-English speakers, are borrowing (or translating) linguistic features from English directly into Spanish. 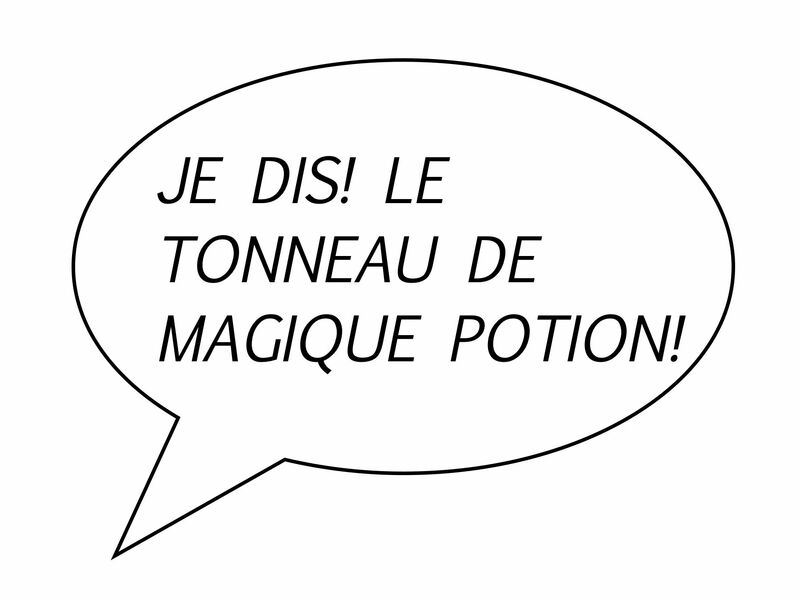 Here’s another example, which relates back to Asterix and Obelix, and Jolitorax’s ‘magique potion’. In Guernésiais, the Norman French dialect spoken by a small number of people in the British Channel Islands, there is a tendency to prepose adjectives rather than postpose them (Gadet and Jones, 2008): that is, to speak ‘back-to-front’ as Obelisk would say. Although all researchers might not agree that the preposed English ADJECTIVE + NOUN construction has been translated directly into Guernsey French, it still seems likely that language contact with English has had some effect. Language changes like this, due to language contact, have been studied by linguists all over the world: from the effects of English on French in North America, to the effects of Irish on the English spoken in Ireland, to the effects of Russian on the indigenous languages of Siberia. It isn’t always easy to prove that the changes really are due to contact with other languages – that is, that linguistic features are borrowed, calqued or translated directly – but the evidence often points that way. All these studies underline the fact that, when it comes to language change, it’s multilinguals who are the real innovators. To try to prove it to you, I have one final example. In Russia, writer and poet Aleksandr Pushkin (1799-1837) is revered as the father of modern literature. Through his works, Pushkin not only influenced every Russian author that followed him, but also transformed the Russian language itself. In particular, he transformed its vocabulary by importing concepts from Western Europe. Sometimes, he borrowed words directly, but mostly he translated them bit-by-bit, as calques: ‘philosophy’, for example, became ‘ljubomudrie’ (‘love of wisdom’); ‘Kindergarten’ became ‘detskij sad’ (‘children garden’). A member of the aristocracy, Pushkin would have grown up speaking French at home, mostly learning Russian from his household servants. As translator Robert Chandler says, Pushkin’s greatest achievement was ‘to make use of every possibility available to him: colloquial Russian, Church Slavonic and borrowings from French, German and English’ (Chandler, 2005). Pushkin is proof that, when it comes to linguistic innovation, bilinguals really are the most creative. In other words, Oscar Wilde was right: ‘talent borrows, genius steals’. Chandler, R. (ed.) 2005. Russian Short Stories from Pushkin to Buida. London: Penguin Books. Gadet, F. and Jones, M. C. (2008) Variation, Contact and Convergence in French Spoken Outside France. Journal of Language Contact, 2, 238-249. This entry was posted in Uncategorized and tagged creativity, french, language, linguistics, Spanish. Bookmark the permalink. It seems the specific lexical examples I cited regarding Pushkin might in fact not be attributable to him: http://languagehat.com/asterix-and-language-change/ (thank you, Language Hat!). However, the broader point about transformation by translation still holds.